This is my last review of the soc 3D masks. I am in love with the maskes as they make the skin so smooth and flawless after a single use. It evens the skin tone and you cannot keep your hands from touching the face now and then. 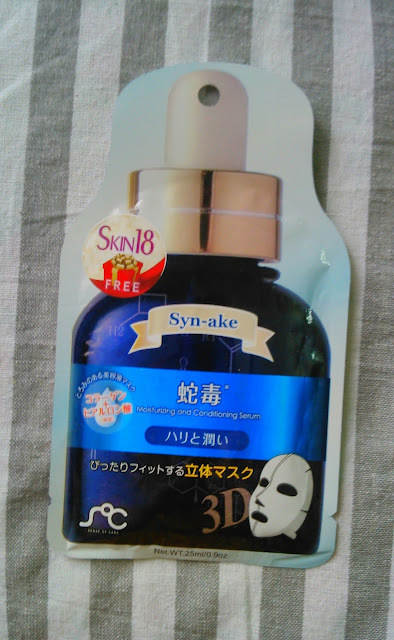 :D.
Let's see the review of Soc 3D Syn-ake Firming and Smoothning mositurising and conditioning serum. Product claims - Formulated with Syn-ake, Centella, Extensin it relieves skin and provides nutrition and mositure. SYNAKE significantly decreases expression lines. Ingredients - Water, Glycerin, Butylene Glycol, Hydrolyzed Collagen, Sodium Hyaluronate, Aloe Barbadensis Leaf Extract, Lactobacillus/Panax Ginseng Root Ferment Filtrate, Dipeptide Diaminobutyroyl Benzylamide Diacetate, Folic acid, Human oligopeptide-1, Lecithin, PEG/PPG -18/4 Copolymer, polysorbate 20, Propylene Glycol, Glyceryl Acrylate/Acrylic Acid Copolymer, Carbomer, PVM/MA Copolymer, Hydroxyethylcellulose, Disodium EDTA , Sodium ascorbyl phosphate, Dipotassium Glycyrrhizate, Alcohol, Phenoxyethanol, Triethanolamine, Allantoin, Tocopheryl Acetate, Methylparaben, Perfume. 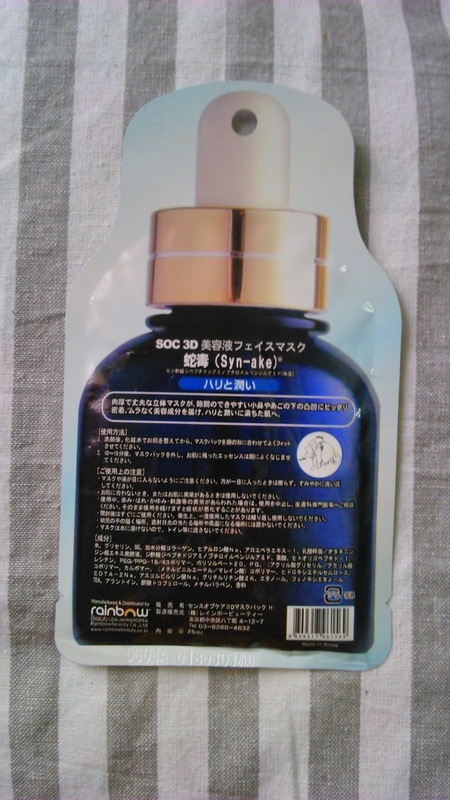 I used this mask like I have used earlier masks with cleansing and toning followed by mask application. The essence is very thick and transparent in appearance. The fragrance of the essence is almost nil and fades away as soon as you put on the mask. The mask fits quite well and the essence gets absorbed easily. After around 15 minutes I removed the mask and let the essence on face dry. The essence is not at all sticky and gets washed off easily. Although washing or rinsing the essence is not recommended I prefer rinsing with water and patting my skin dry. As said earlier the essence is not at all sticky and doesn't leave a residue behind. After the essence is rinsed off the skin feels smooth and hydrated. It evens the skin tone and heals the dry patches of skin. It makes the skin plump and hides the unevenness of the skin if any. I didn't find any glowing effect after using this mask. Overall the mask is a must try. Availability - available at skin18.com website at affordable prices. Price - $1 on Skin18.com website. Currently as a freebie on website. The mask is like any other hydrating mask which makes the skin smooth, soft and silky. It makes the skin plump and hides skin tone unevenness. It hydrates the skin without any sticky feeling. A must try once in a lifetime at least. Recommendation Yes I think one should surely try these masks to feel the effect of hydrated skin. Leave your blog urls for me to checkout!! !